No, it's not February, but I did have a lot on back then, so I didn't deign to write up the suspense thriller Non-Stop at the time of release. Seeing as how it's back in Cineworlds across the UK today as part of their Take Two promotion, now seems as good a time as any to rake over my thoughts about it. After all, you're now in a race against time, for your last chance to see this in cinemas and enjoy the-- oh, forget it. 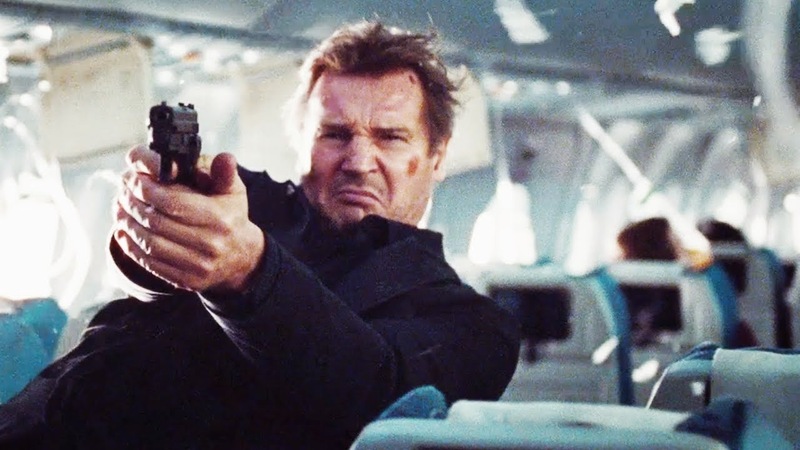 An federal air marshal who hates flying (and doesn't seem to be a particularly big fan of being in contained situations with people either) sounds just like a character Liam Neeson would play of late. And sure enough, on a red-eye flight from New York to London, his Bill Marks becomes a player in a cat-and-mouse game with a killer who threatens to kill one passenger every 20 minutes unless the authorities pay him a ransom for the plane. Bill has no idea who the threatening text messages are coming from, but he doesn't have long to get to the bottom of it once people start dying mysteriously. Right out of the gate, let's just address the fact that this is a daft film. It is mind-bogglingly daft, and all that really remains to say is whether or not it's entertaining too. 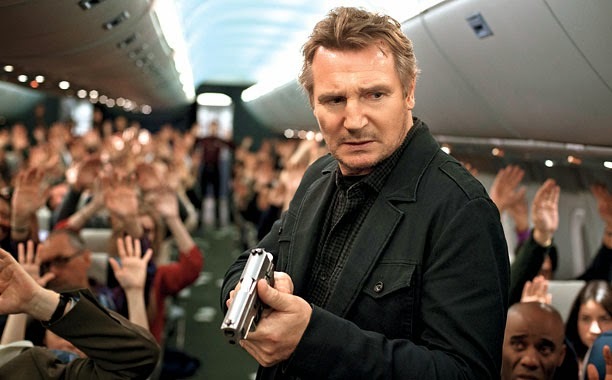 This kind of Liam Neeson film is usually watchable, within reason. It's not as daft as either Taken 2 or his previous collaboration with director Jaume Collett-Serra, Unknown, but that leaves it feeling much duller than either of them. As with Unknown, there's obviously a character that Neeson has latched onto, but he's pretty much alone in that regard. Three different screenwriters worked on this, and they managed to wring a feature-length movie out of a contained setting. But this is in no way comparable to something like Locke, because it gets through with convoluted twists and a surplus of characters to keep things "lively". It's a long slog on the way to the reveal, and that's to say nothing of how obvious the identity of the villain is. There are a few red herrings thrown in along the way, as the screenwriters write themselves into a corner to try and keep the suspense going until the big reveal, but as soon as you see this actor, you know who's on the other end of the phone. It's so inept in its character development that Bill eventually delivers his whole life story to some understandably bewildered and frightened passengers, about a minute before the expository outburst is actually important to keep the plot moving. There's precious little development outside of that, and the film almost crosses the line twice by having the eventual culprit behind the murders do the exact same thing not 10 minutes later, except the reasoning behind the whole scheme is not only absurd, but pathetic. Non-Stop is the kind of film that Liam Neeson can do in his sleep these days, but in the way it's executed, it feels like that's exactly what he's doing. The script is laughable, the suspense is almost non-existent and the plane's manifest is packed with recognisable actors who have boarded for roles that amount to nothing at all. It's a whodunnit which resorts to narrative gymnastics to try and put us off the obvious culprit, but falters long before it even attempts to stick the landing. Non-Stop is showing in Cineworld cinemas nationwide today, and tickets are 2 for £10. It will be released digitally and on DVD and Blu-ray on 30 June 2014.